Is bigger really better for China’s GDP? Over the last few months there’s been a fair amount of news about China’s GDP statistics, all of it pointing in one direction: China’s level of output and income was larger than we previously thought. This has been pretty much universally taken as good news for China, and generally as reinforcing the China-is-big and China-is-taking-over-the-world narratives in the press. But there are some other more sobering implications that are also worth pointing out. In October, the IMF released updates to its World Economic Outlook database that incorporated the latest estimates of purchasing-power parity exchange rates. This pushed China’s per-capita GDP at PPP in 2013 from $9,828 to $11,868. It’s not everyday that economies grow 20% overnight! The change unfortunately also resulted in a lot of guff about how China had suddenly become the world’s largest economy, which is mostly nonsense: PPP exchange rates are really intended to help compare living standards across countries. For most purposes, the total size of an economy is something that’s much more meaningful at market prices. China objected to the new PPP estimates, apparently mostly because it didn’t want people to think it was the world’s largest economy. Mostly this seems to be a political rather than technical objection: China often finds it advantageous to present itself as a developing country with lots of poor people rather than a major global economic power (of course, it is both). And given how the press keeps harping on the China-as-largest-economy theme, those jitters seem justified. However it’s not clear what the technical quibbles actually are, and it it seems much more likely that the new PPP numbers are in fact more accurate. Economists including Robert Feenstra and Angus Deaton have pointed out problems in the 2005 estimates that would have over-estimated the PPP exchange rate, and under-estimated GDP, which seem to have been corrected in the latest work. But Chinese statisticians rather reinforced the trend when in December they published the results of their own economic census, a quinquennial effort where they go around the country and try to make sure they have an accurate count of businesses and their output. This resulted in GDP estimates for 2013 being revised upward by 3.4%, or about $308 billion. In the Chinese context, this was in fact not a huge change, even though it is equivalent to finding another Malaysia lying around. So apparently it’s okay for Chinese GDP to be a bit bigger, just not a lot bigger. All this is perhaps more than just a storm in a statistical tea cup, as much fun as it is to debate the technicalities. China’s income level does have implications for how its economy might perform in the future. This is because fast-growing emerging economies like China benefit from what is called “catch-up growth”: they can grow more quickly than the US and Europe by adopting technologies and practices from them. Because China doesn’t have to invent everything itself, but can rapidly absorb past inventions from other countries, it can grow faster than countries where those inventions are already widespread. But catch-up growth has this property: the more of it you’ve already done, the less of it you have left to do. 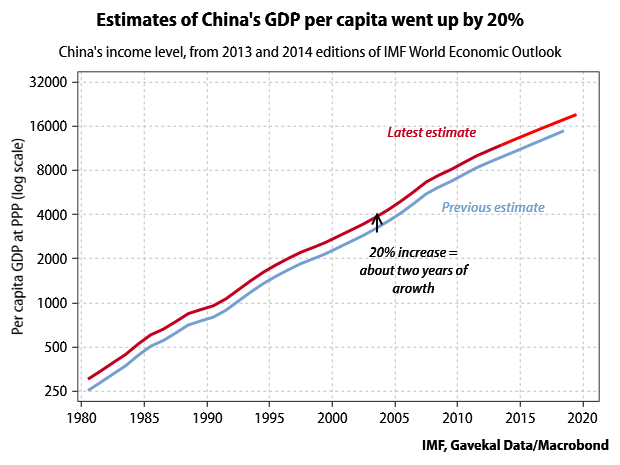 The fact that estimates of China’s income level keep getting higher means that China has in fact done more catching up than we realized–about two years worth, to be precise (i.e., per-capita GDP in 2014 is now at a level that China was previously not forecast to reach until 2016). So the more successful China has been at catch-up growth, the closer the future gets when China is just an ordinary economy that does not grow at supercharged rates. 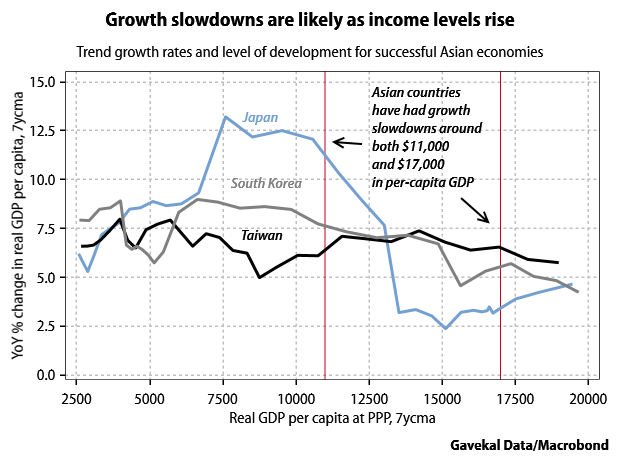 One illustration of this general tendency is the research Barry Eichengreen and his Korean co-authors have done on growth slowdowns. They find that there has been a pattern for economies to shift to a permanently slower rate of growth around $10-11,000 of per-capita GDP, and sometimes again around $15-16,000. So the fact that China is currently around $12,000 per-capita GDP means that its growth slowdown over the past few years is likely to have been a permanent downshift, and not a temporary episode that will be followed by more fast growth at the previous rate. While this is certainly my own view, it has been a contentious one within China, where some prominent local economists insist potential growth has not slowed down. The winds shifted last year, when the Chinese government’s official rhetoric about getting used to a “new normal” for the economy marked an acknowledgement that 10%-plus GDP is indeed a thing of the past. But the patterns from Eichengreen’s research also suggest China could well have another downshift in growth in a few years time, and this is certainly not the official line. So probably the most important implication of the fact that China’s economy is bigger than we thought is that the slower-growth future is closer than we thought, too. This of course is a mark of success, not failure.